Last week, Chef announced Chef Automate 1.6, which provides significant new capabilities to help organizations reduce risk, improve efficiency, and increase speed. Headline features of the release include new capabilities to make it easier to detect and act on compliance issues, improved data handling to reduce storage requirements by 20%, and notifications to help teams respond quickly to critical problems. Organizations often use Chef Automate to gain visibility of compliance status across the fleet. Updates in 1.6 put more power in operators' hands to assess current status, satisfy reporting requirements, and take corrective action. All compliance profiles have been updated with build numbers to make it easier to apply precisely the set of controls needed. A new filter allows users to search and filter by control, enabling more granular insight into status. 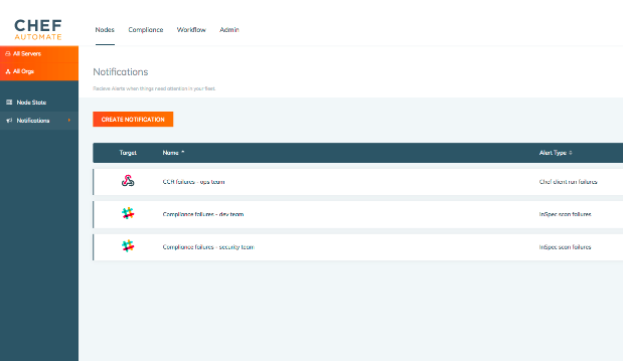 And users can now see detailed compliance status and history by node. Importantly, Chef Automate 1.6 adds the ability to export reports to CSV, making it easier to satisfy audit requirements. Chef Automate is used in a variety of demanding environments, including those that span beyond 50,000 nodes. In the 1.6 release, we've improved data handling in Chef Automate and upgraded to the latest version of Elasticsearch. As a result, users can expect a 20% reduction in on-disk index size for converge and compliance data, improving capacity for growth and helping drive down costs. With the 1.6 release, we have made notifications available as an open beta program. Chef Automate now supports simple configuration of Slack or webhook notifications for Chef client run failures and critical compliance control failures. This capability helps shorten the detect-and-correct cycle to reduce security and compliance risk while maintaining application availability and performance. For more details on Chef Automate 1.6, be sure to see our release announcement. Explore what Chef Automate can do. In this Learn Chef Module you'll get Chef Automate running in 3 steps. The post Chef Automate Release – August 2017 appeared first on Chef Blog.